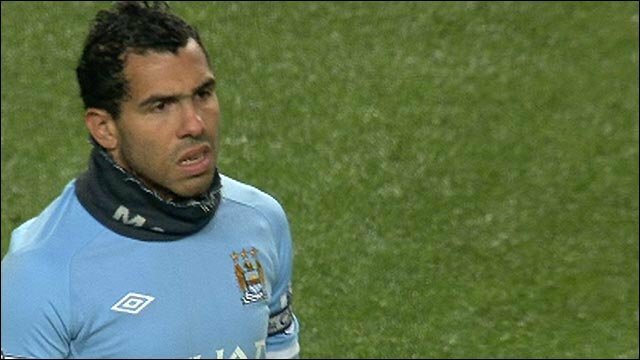 Manchester City striker Carlos Tevez has withdrawn his transfer request after talks with the club. The 26-year-old Argentine, who joined City in July 2009, said earlier this month that he wanted to leave after falling out with club officials. But City said in a statement on Monday that Tevez has expressed his commitment to the club and will stay at Eastlands. "Carlos and the club are keen to focus on the opportunities ahead and his contract remains unchanged," it said. Manager Roberto Mancini added: "Carlos is a world-class player whose contribution since he joined the club has been invaluable. "I am pleased that we are now able to focus on pure football matters and to be able to look forward to Carlos continuing to play a significant role in the club's progress." That "significant role" included retaining the captaincy as he made an instant return to the team for Monday's Premier League match with Everton at Eastlands after being left out of a weakened squad for Thursday's Europa League game with Juventus. City made Tevez the Premier League's best-paid player when he controversially joined them on a five-year deal. That move came less than a month after his former employers Manchester United rejected the chance to make a loan deal permanent, believing a fee in the region of £25.5m to secure his economic rights from his advisers to be excessive. However he made an instant impact at Eastlands, scoring 29 goals in his first campaign, and was made team captain by Mancini in August. Despite scoring 10 times in 18 appearances so far this term, there had been reports of Tevez falling out with Mancini while he has also admitted to being homesick with his estranged wife and two young children living in Argentina. His unhappiness came to a head on 12 December when he handed in a written transfer request and claimed his relations with "certain executives" at City had "broken down beyond repair". City, in turn, criticised Tevez's long-time adviser Kia Joorabchian, describing his actions in relation to Tevez's situation as "disappointing". Despite the conflict seemingly becoming increasingly acrimonious, Mancini expressed his hope that Tevez would stay, while City's football administrator Brian Marwood said he expected the player to see out his contract, which runs to July 2014. It seems Tevez, who always insisted he would remain available for selection, has now resolved his issues - for the time being at least - to the relief of the club. Speaking to Sky Sports 1 ahead of Monday's match against Everton, Mancini said: "I am happy that we finish this and Carlos stays, it's very important for everyone." Asked if it was a big decision to keep Tevez as captain, he added: "No, absolutely not, it was easy." Any questions about how City's fans would react to Tevez after his stand-off with the club were answered when they gave him a warm reception during the warm-up for Monday's game.